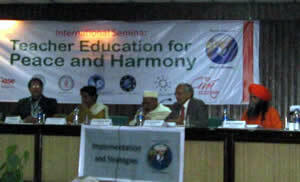 An International seminar on Teacher Education for Peace & Harmony (www.iaseve.org.in) was conducted at Gandhi Darshan, Rajghat in New Delhi, India from 11 to 13 February. The seminar was organised under the chairmanship of Shri Kanakmal Dugar, the Chancellor of IASE (Institute of Advanced Studies in Education) and president of GVM (Gandhi Vidya Mandir). The supporting organisations of the seminar were Gujarat Vidya Pith, Ahmedabad; Jain Vishwa Bharti, Ladnun, Rajasthan; Temple of Understanding, India; National Spiritual Assembly of the Baha’is of India and the International Support was given by Global Harmony Association. About 250 delegates participated from India and other countries including Rwanda, Malawi, USA, Russia, Switzerland, Spain, UK, Brazil, Romania ,Nepal ,Bhutan, Bangaladesh and Iran. 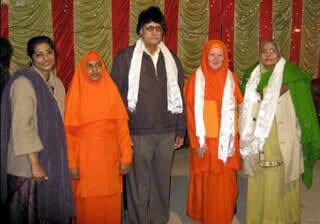 Amongst them were Dr. Charles Merceica, the President of International Association of Educators for World Peace Dr. Leo Semashko, the President of Global Harmony Association, Dr. Nina Meyerhof, the President of Children of the Earth , Avadhutika Anandarama Acarya of Ananda Marga Gurukul, Acarya Vandanananda Avadhuta, Global Worker of Prout & Neo-humanism, Swami Chidananda Muni ji of Parmarth Niketan, Rishikesh and many Gandhian activists and peace workers. Didi Anandarama and Dada Vandanananda presented the ideas of Neohumanist Education in the plenary session to all the delegates. Dada Vandanananda along with Co-chairing one of the plenary sessions also became the Guest of Honour in the special session on Value Education held by Sanskaram. Amongst the other speakers who gave their presentations on Neohumanist Education were Acarya Jyotiprakashananda Avadhuta who co-chaired the thematic session on Preparing Peace Teachers and Peace Workers in the Community . Ajay Pandey Dada also gave his presentation on the neohumanist ideals of Shrii P R Sarkar. Acharya Kishan Sood gave his presentation as lead speaker in a thematic session on Ecology in Education for Peace: Implications for Teacher Education. Avadhutika Anandajyotirekha Acharya, Mrs Moksha & Shri Antarang Anand Yogi gave their presentations on Neohumanist Skills and Activities for Teacher Education for Peace and Harmony on the ideals of Shrii PR Sarkar. Acarya Amrtaksarananda Avadhuta gave his presentation on Role of Teacher in Multicultural and Multi-ethnic Society. Along with these plenary and thematic sessions there were special sessions on Global Harmony Text Book Release known as “ABC of Harmony”, a book written by 75 co-authors from 26 countries and chiefly edited by GHA President, Dr. Leo Semashko. The other special sessions were a book release of the English version of “Manava Vyavahar Darshan” (Philosophy of Human Behaviour) by Baba A. Nagraj and finally a media session on “Role of Media for establishing Peace & Harmony Globally” in which more than 100 journalists attended. There was a Post Seminar Workshop at IASE University, Sardarshahar, Rajasthan where a curriculum for Peace Teachers education was drafted by invited delegates for the proposed International Peace and Harmony Institute in the structure of IASE, Gandhi Vidya Mandir under the leadership of Chancellor of IASE,Shri Kanakmal Dugar and Dr. Laj Utreja, the President of GHA-USA and Dr. Leo Semashko, the GHA Global President. In the presentations at the workshop Acarya Jyotiprakashananda Avadhuta spoke on “How to establish ideal human society based on moral and spiritual values with the ideals of ¬Morality as the Base, Sadhana(Intuitional practice) as the means and Life Divine as the Goal”. Dr. Laj Utreja supported these Neohumanist ideals for the making of Peace Teachers in the Peace and Harmony Institute to be based on Yoga-Sadhana. After the post seminar workshop Didi Anandarama gave her special presentation amongst the teachers and B-Ed students of IASE. She was also invited to the Jain Vishwa Bharti University at Ladnun, Rajasthan on 17 Feb where she gave a presentation on Neohumanist Education to over 200 teacher students and visited the campus and adjacent schools.